Lectures have been the most common form of teaching and learning since ancient times. Didactic lecture is more passive in nature and less effective teaching tool when compared with active learning methods, such as problem-based learning and bedside clinics. However, a well-organized lecture remains one of the most effective ways to integrate and present information from multiple sources. Hence, assistance in the form of audio-visual aid is needed to enhance the quality of the lecture. A blackboard is commonly used in lectures as a mode of delivering information, while the use of transparencies and PowerPoint (PPT) with an overhead projector (OHP) are the other effective modes of delivering lectures. Technological advancements have revolutionized in every field including teaching. Use of electronic presentations has become very frequent, and Microsoft PPT is now the most popular teaching aid used out of all electronic presentations even in medical education. Previous studies have shown that learning with audiovisual aids has a great impact on students. The objective of our study was to find out students perspective regarding blackboard and Microsoft PPT teaching methods in Medical education. A cross-sectional questionnaire-based study was conducted at Yenepoya Medical College, Yenepoya University, Mangalore, Karnataka, India among 1st year medical students. The participation in the present study was on voluntary basis. A predesigned and pretested questionnaire containing 15 questions was used to collect data. A questionnaire was designed to assess the opinion of students regarding blackboard and PPT presentation on Biochemistry topic. The questionnaire form was validated by five subject experts prior to the study. The study was conducted in students who have already exposed to various teaching aids earlier. Forty-nine (n = 49) medical students, who are in 1st year M.B.B.S course, were participated (girls-24 and boys-25) in the study. Students were summarized about objective of the present study and assured confidentiality and also instructed to mark appropriate teaching aids for each question in the questionnaire form and give their overall opinion regarding the best teaching aid they preferred. All the students attended the questionnaire. Data were entered in Microsoft Excel (U.S.A) and were analyzed by statistical analysis software (U.S.A). 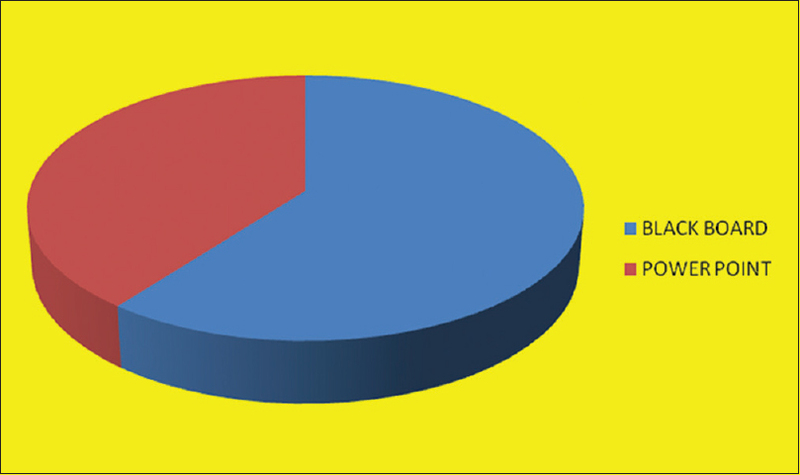 Results are expressed in percentages and shown with the help of bar diagram and pie chart. In this study, most students selected blackboard teaching is the best teaching aid when compared to PPT teaching method. 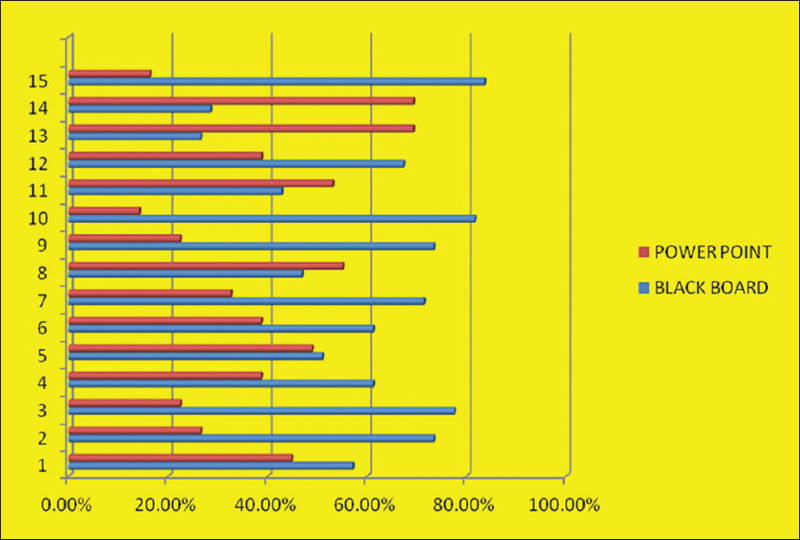 [Table 1] shows students opinion for all 15 parameters against blackboard and PPT teaching methods. And also, the overall preference of students toward the best teaching aid was blackboard (60.43%) and remaining 39.56% preferred PPT teaching method [Figure 1] and [Figure 2]. The teaching learning process in medical professional is crucial; because this is the time when students are taught about pathophysiological concepts of diseases and their management and also they come in touch with patients in the hospitals. Moreover, the curriculum in medical education is changing continuously. Needs of learners are changing and role of teachers is being redefined at the same time. One has to keep pace with the ever changing needs of the learners and changing trends in education. Hence, if the needs of the learners are considered while during teaching, the process of teaching-learning can be made effective. In this study, we tried to find out the gaps, if any, by taking students' feedback, in the 1st year medical students about their teaching opinion in Biochemistry subject. Learning and teaching are continuous processes which act simultaneously. This can be demonstrated when learners acquire the ability to express their gained insight, realization, facts, and new skills., A good teaching needs a good communication for exchanging ideas and information. It is a complex process and has five main components viz. source (teacher), receiver (audience/students), message (content/lecture), channels (medium/traditional blackboard, OHP, and PPT), and feedback (effect). The major limitation of lectures is that listener passively receives the material and feels bored and sleepy. Lectures can be made more effective by using visual aids. Blackboard is most commonly used visual aid as it has easy access and relatively simple to use. It needs no special equipment except for chalk, board, and duster which are easily affordable. Moreover, handouts are not given out in advance in blackboard teaching, so the students tend to focus more intently on the lecturer. Hence, a good lecturer can motivate the students on a journey of discovery, exposing students to one interesting fact after another by blackboard teaching method. Students will have better retention of the subject afterward if the notes are written with the lecturer's explanation. However, blackboard teaching aid may cause note-taking fatigue, especially after continuous and long lectures. In blackboard, teaching can be difficult to catch continuation with the lecturer if student lose focus for even a moment. In Microsoft PPT presentation, the lecturer prepares photographic slides and distributes the same to the students before the lecture. The lecturer shows the PPT slides and explains the important points during the lectures. The lecturer has to work in preparing slides well in advance. PPT promotes better organization and understanding of the lecture topics as the coverage and flow of subject are well fixed within a finite number of slides. During lecture, the individual PPT slides serve as memory aids, which reduce the mental strain on the lecturers. As most of the contents are already given in the form of handouts, this reduces the need to take notes during the lecture and students find this PPT method less tiring. Moreover, students able to pay more attention to the discussion part of the topic instead of taking notes. The handouts are also more portable and distributed as softcopies rather than printed copies. Students can easily view these softcopies on any electronic device such as a personal computer, laptop or even in mobile phone. PPT slides can be reused or can be edited with ease for future lessons; this makes lectures to prefer this aid. However, few drawbacks come with PPT presentation. Some lecturers tend to create PPT slides that are more suitable for them to read rather than explaining. Present study has shown that blackboard teaching is still remains the most preferred teaching aid by our students (60.43%) when compared to PPT teaching method (39.56%). In blackboard-based teaching, the students are active participants and are able to cope with the teaching speed of the teacher. It also motivates an interest in students and helps in holding attention in the class. Moreover, handouts are not given out in advance in blackboard teaching, so the students tend to focus more intently on the lecturer. Hence, a good lecturer can motivate the students on a journey of discovery, exposing students to one interesting fact after another by blackboard teaching method. Students will have better retention of the subject afterward if the notes are written with the lecturer's explanation. However, blackboard teaching aid may cause note-taking fatigue, especially after continuous lectures. If the students lose focus for even a short moment, it can be difficult to catch up with the lecturer. To a certain extent, the legibility of the lecturer's handwriting also plays an important role for the method's success. In this study, 83.6% students preferred blackboard as it facilitates interaction between students and teacher, 81.6% felt that flow of thought is better, 77.5% students opined blackboard teaching stimulate interest, 71.4% of students felt better understanding of topic, and 73.4% of students felt problems can be better solved in blackboard teaching. 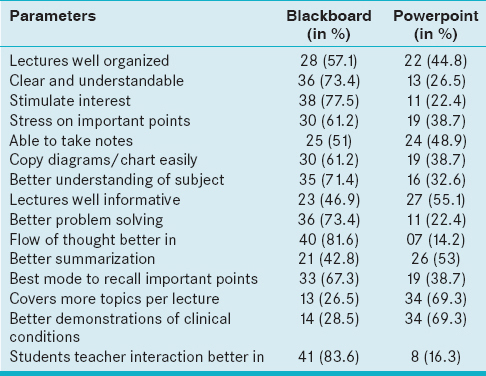 However, students felt blackboard was ineffective in a demonstration of clinical conditions (28.5%) and covering more topics per lecture (26.5%). These parameters scored highest preference in PPT teaching method. The parameters such as flow of thought (14.2%), student-teacher interaction (16.3%), and stimulating interest (22.4%) were scored low with PPT teaching method. Our study result is comparable to the previous studies by Banerjee et al., and Novelli and Fernandes., In this study, only 39.56% of students preferred PPT teaching method. The reason for this may be dark room during the presentations wherein, students may get bored or fall asleep with this environment. Students may also feel difficult to keep up to the speed of the teacher, making it difficult to copy diagrams or writing notes. In this study, the opinions were collected only from a single batch of 1st year medical students which is a drawback of this study. However, a metacentric study with high sample size would be beneficial to assess the best teaching aids in medical education. Traditional blackboard teaching method just cannot be completely neglected. Blackboard teaching aid still stands at the top. However, it can be made more and more effective by combining it with other teaching aids like PPT. Forrest S. Learning and teaching: the reciprocal link. J Contin Educ Nurs 2004;35:74-9. Squires G. A frame work of teaching. Br J Educ Stud 2004;52:342-58. Falk-Nilsson E, Walmsley D, Brennan M, Fournier DM, Junfin Glass B, Haden K, et al. 1.2 Cognition and learning. Eur J Dent Educ 2002;6 Suppl 3:27-32. Ormrod JE, editor. Human Learning. 3rd ed. Sydney: Prentice Hall; 1999. Chadwick SM, Bearn DR. Teaching and learning: an update for the orthodontist. J Orthod 2002;29:162-7. Baxi SN, Shah CJ, Parmar RD, Parmar D, Tripathi CB. Students perception towards different teaching aids in a medical college. Afr J Health Prof Educ 2009;1:15-6. Prasad S, Roy B, Smith M. The art and science of presentation: electronic presentations. J Postgrad Med 2000;46:193-8. Sharma R, Verma U, Kapoor B, Chopra VS. Novel teaching approaches in Pharmacology. JK Sci 2004;6:172-3. Lalvarmawi F, Ningthoujam S, Uttam Naithok, Mishra M. Perception of postgraduate students on teaching aids. J Med Soc 2013;27:36-8. Falk-Nilsson E, Walmsley D, Brennan M, Fournier DM, Junfin Glass B, Haden K. Cognition and learning. Eur J Dent Educ 2002;6:27-32. Chadwick SM, Bearn DR, Jack AC, O'Brien KD. Orthodontic undergraduate education: developments in a modern curriculum. Eur J Dent Educ 2002;6:57-63. Golden AS. Lecture skills in medical education. Indian J Pediatr 1989;56:29-34. Banerjee I, Jauhari AC, Bista D, Johorey AC, Roy B, Sathian B. Medical students view about the integrated MBBS course: A questionnaire based cross-sectional survey from a medical college of Kathmandu Valley. Nepal J Epidemiol 2011;1:95-100. Novelli EL, Fernandes AA. Students' preferred teaching techniques for biochemistry in biomedicine and medicine courses. Biochem Mol Biol Educ 2007;35:263-6.